The Pilgrims weren't always THE Pilgrims -- read all about their lives before they landed at Plymouth Rock. Your child can ABC his way through this colorful Thanksgiving maze, for fun practice with the alphabet and letter recognition. Gobble, gobble! Find the Thanksgiving nouns and adjectives in these sentences, and learn a bit of history in the process. Practice parts of speech this Thanksgiving with a festive grammar worksheet. This one is all about nouns--people, places or things! Learn all about The Mayflower, the famous ship the Pilgrims made their great journey in. When reading up on Native American history, take some time to check out a few Native American activists throughout history. Learn Thanksgiving facts with this fun trivia worksheet. These Thanksgiving facts will help teach you and your child about the holiday. Thinking about Thanksgiving? 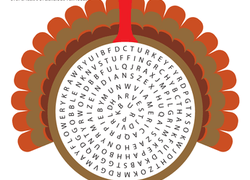 Help your kid learn some important Thanksgiving terms with this colorful word search puzzle. Feeling thankful? That is what Thanksgiving is all about! Help your child get into a grateful mood with this colorful writing activity. This Thanksgiving, take a moment to reflect on the other side of the story: the one from the Native Americans' point of view. Here's a worksheet on the Wampanoag, the tribe that the Pilgrims feasted with, just in time for Thanksgiving. Gobble gobble! Help your kid learn about Thanksgiving with this colorful word search printable. Set the Table: Play the Thanksgiving Dinner Game! Count down the minutes till dinner is served by unscrambling the names of Thanksgiving dishes and collecting as many dishes as you can. Flex your imagination this Thanksgiving, with a fun writing prompt in honor of turkey day. Your student will hone storytelling skills and practice handwriting. Serve up some authenticity this Thanksgiving with the easy recipes in this worksheet on famous Native American foods. Make writing practice fun this Thanksgiving, with a writing prompt about the Mayflower. Your child will flex her imagination and her knowledge of U.S. history. Put a fun twist on writing practice with a fun Thanksgiving writing prompt. Your child will polish her persuasive writing skills and stretch her imagination. Which Native American tribe helped the original settlers in Plymouth? Put your child to the test with a colorful crossword puzzle all about Thanksgiving.